Keywords: Wound bed preparation; TIME; education; partnership. Evaluation and 'quality control' measures are needed to ensure the effectiveness of a collaborative approach. A major challenge for tissue viability nurses is to deliver education to support clinicians in the everyday management of complex wound types. This article describes how a large city primary care health care authority worked in partnership with a commercial company and a higher education institution to provide valuable education to nurses and podiatrists. This was achieved by using the concept of wound bed preparation and the TIME framework to develop a series of accredited study days offering a structured approach for teaching the skills necessary for both assessing and managing the compromised healing wound. The management of chronic wounds is a dynamic process, which is changing rapidly owing to the availability of advancing technologies and improved understanding of the barriers to wound healing. The management of wounds makes up a considerable proportion of a nurse's workload . Patients with compromised healing wounds are cared for in a variety of health care settings, by a number of clinicians, during their journey of care. For this reason the development of a consistent and structured approach to wound assessment is of value. This approach needs to be understood by all clinicians, at all levels, to improve wound assessment skills and reduce variations in practice. 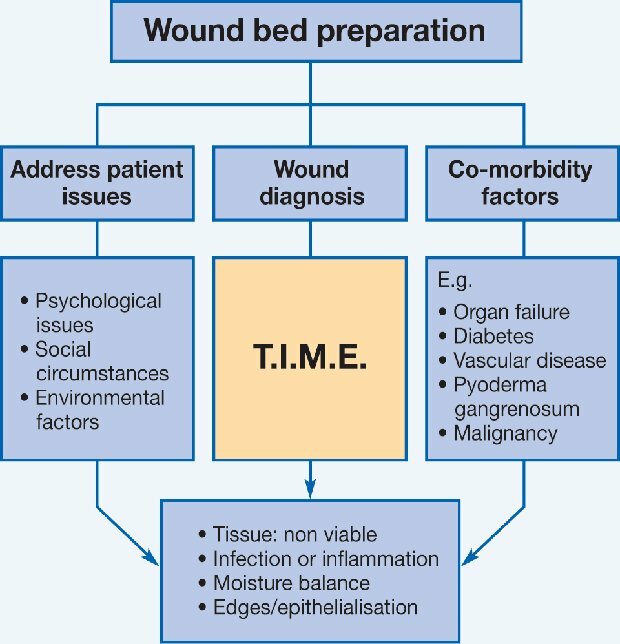 Wound bed preparation (WBP) and the inclusion of TIME, a concept developed by the International Advisory Board for WBP, provide such a framework . The challenge is to deliver education to those clinicians who provide wound management and to support them in adopting the framework in their everyday management of complex wound types. WBP offers a comprehensive approach to wound management, which takes into account 'patient issues', 'co-morbidity problems' and 'wound diagnosis' and has been well documented since its development in around 2000 . The framework gains credibility in the fact that it was developed by an internationally renowned group of wound care experts, who formed the International Advisory Board to gain consensus in wound management . It has since been "...widely adopted as an effective approach to the management of chronic wounds". Each component identifies a negative barrier to healing or imbalance that may be dominant - for example, slough (T) or infection (I). This in turn guides the clinician to develop an action plan for converting the wound to a balanced state, promoting progression towards healing. In addition to facilitating symptom management, the concept of TIME has enormous potential as a tool to provide a structured approach for wound assessment. The success of any theoretical framework is reliant on it being easily understood and user-friendly. Ideally, it will become an integral part of everyday practice. If clinicians see value in the tool and can relate it to practice, they are more likely to take ownership of the concept. Barnum argues that "...if we cannot evolve theories that truly direct, we are wasting our time". He goes on to state that, "...if a nursing theory is any good, it will be practical". Widespread acceptability and the use of the term 'wound bed preparation' in everyday discussions on wound care support this sentiment. By serving the needs of all healthcare professionals, TIME has become a valuable tool in promoting a common language in wound management, helping to break down potential barriers between professionals working in this field and encouraging a consensual, multidisciplinary approach to wound assessment. In the context of chronic wound management, any theoretical framework should be flexible enough to be used across different wound aetiologies. The dynamic and versatile nature of the TIME concept has been clearly illustrated in its application to many different wound types, including the diabetic foot ulcer, venous leg ulcer and pressure ulcers. 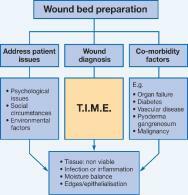 The concept of TIME therefore offers a practical, flexible theoretical tool to develop a new model for wound management education. Prior to the implementation of the new educational model involving a series of accredited study days, clinicians developed their knowledge and skills in a number of ways. This included reading journals, receiving information from sales representatives on product usage, ad hoc study days and discussion with colleagues. However, there are limitations when information is gained in this way. Decision-making may be based more on intuition than on a clear rationale for action. Therefore, a transfer of focus from intuitive to more analytical ways of examining wound assessment will provide a structure "...so that both professionals and patients have a means of knowing the basis of decisions about treatment". Education is an integral part of the clinical governance agenda, which includes "...education, clinical audit, clinical effectiveness, risk management, research and development and openness". The introduction of a formalised educational programme provides the clinician with evidence-based rationales from which they can challenge their practice and build on their knowledge and skills in wound management. One of the objectives in developing the WBP and TIME study days was to encourage the clinician to become more discerning in analysing the diverse sources of information already being accessed. It has been stated that "NHS trusts are constantly challenged to achieve a balance between their resources and meeting the needs of the society they serve". One way this may be achieved is through working in partnership with a commercial company. This is further reinforced through guidance on working with pharmaceutical companies, which states that, "...all joint working projects must promote and enhance equitable access to evidence-based health care". It is in the best interests of all those working in the partnership, including the health care authority, commercial company or higher education institution (HEI), to ensure that cost-effective wound management is carried out to benefit the patient. Inappropriate wound care can result in delayed healing, loss of confidence in the clinician by the patient and poor use of resources. Commercial companies provide information on the use of their products and on related topics. Flanagan argues that, with regard to tissue viability, "...the close relationship between product manufacturers and clinicians has been used to everyone's advantage to develop a wide range of high-quality educational resources", which includes CD-ROMs and published research on the products involved. There is a risk that information may be biased in favour of the products sold by the commercial company. However, many companies provide comprehensive, high-quality educational packages. In addition, some offer the support of a clinical specialist, which is beneficial to all concerned. Furthermore, companies have access to research and development teams, which provide further support to their educational packages. Previous collaboration with a commercial wound care company (Smith & Nephew Healthcare) on a number of educational initiatives opened the door for a partnership. This involved WBP study days, which were held four times each year, the support of a clinical specialist employed by the company and an interactive educational wound management guideline (available as a CD-ROM and on the primary care intranet). This provided a useful adjuvant to the development of the new model of education and allowed clinicians to carry out pre-study day learning or post-study day revision. Involvement of HEIs can complete the partnership by ensuring quality assurance in educational provision, whereby everyone concerned can place a value and relevance to the education accessed. The content of educational resources must be practice driven and always relevant to professional practice. The HEI must be up to date in advances in wound management and develop their curriculum to reflect changing needs. Lecturers in tissue viability in the HEI can collaborate with a tissue viability nurse (TVN) to ensure that the course content is relevant to changing health care needs and advances in wound management, while the HEI can devise a method of providing accreditation and quality control through the validation process. Flanagan states that, "...development of educational resources is both expensive and time consuming". A tripartite working partnership may therefore ensure the best use of resources, with stakeholders having an interest in ensuring that the clinician develops appropriate skills in wound management to improve patient outcomes. The relationship between the members of the collaboration is symbiotic, with each party being dependent on the contribution of the others. The health care division needs the financial and educational support to update practitioners; the commercial company needs access to the clinicians and the educational establishment to provide an educational forum to support the use of their products; and the HEI needs the students and financial resources to provide their services. This interaction can be viewed as cyclical in nature and beneficial to all parties involved. The patient is the central focus, supported by the clinician, who has the relevant skills and knowledge to progress the patient's wound towards healing whenever possible (Figure 2). The development of educational study days is a dynamic process and each member of the partnership must support and challenge the others to ensure that the content keeps up to date with advances in wound care. The limitations to this approach include potential resistance to change and scepticism resulting from commercial xenophobia. The perception may be that maximisation of profit is the main driving force of the commercial company, rather than striving to improve patient outcomes through appropriate use of their wound care products. The HEI may be viewed as having the ability to deliver academic theory but be out of touch with the application of practice. By contrast, the health service may be viewed as an altruistic service with limited resources, carrying out practice that, rather than being evidence based, is grounded in experiential learning. However, all three members of the partnership provide a service to care for patients with complex wounds and therefore have a vested interest in achieving positive outcomes. A mutual interdependence provides control in the form of checks and balances to ensure that all participants fulfil their role. This is essential to ensure that there is not a bias in the information supplied or an unacceptable standard of care provided. The involvement of academic institutions can therefore be integrated to ensure that 'quality control' is achieved and maintained through validation and accreditation. The HEI also has experience in exploring different learning styles, and therefore in identifying which technique will best suit the individual attending the study day and in articulating the course aim and objectives. Overall, therefore, this should result in a win-win situation for patient care. At the time of inception of this new model for wound care education, Caledonian University had already been working in partnership with the primary care TVN for five years in the development of a wound management module. It was therefore a natural progression to approach the tissue viability lecturer to pursue accreditation for the educational sessions. Once discussion had taken place and a draft format had been compiled, with agreement that the process should be taken forward, the clinical specialist and HEI were contacted to build on the framework and offer their expertise in the academic quality of the sessions. Commence with the whole, subdivide into parts and then re-synthesise into the whole. Accreditation with completion of a further piece of work in an agreed period of time and gaining ten level-three Credit Accumulation and Transfer points following matriculation with Caledonian University. A common, traditional approach to educational sessions is to carry out formal lectures, followed by discussion, if time permits. The advantage of this approach is that a large amount of information can be conveyed. If there is time for discussion following the lecture, this may provide an opportunity for those attending to ask questions or seek further clarification of points raised. This was the format of the previous WBP study days, which were evaluated positively, well attended and provided a valuable forum for disseminating information on the WBP concept. However, the introduction of the TIME framework to structure learning provided an opportunity to consider creative ways to develop the new study days. As Flanagan states, "Developing educational strategies that promote the use of evidence-based practice is achieved through sharing knowledge, critical analysis, managing change and leadership". Therefore, the plan for the sessions was to provide an environment in which, despite differences in the levels of development of those attending, they would all have experiences and knowledge to share and reflect upon. Discussing the application of TIME would encourage clinicians to consider the benefits of adopting a structured approach in practice, thus bridging the theory-practice gap. If matriculating, build knowledge and skills on the use of information technology, literature search and flexible styles of learning. It has been postulated that, "...one element in skills teaching is developing familiarity with each part by breaking the skill into component parts and developing familiarity". The structure of WBP and TIME sessions complement this approach, starting with a general overview of WBP, followed by discussion of each individual component of TIME and then returning to a holistic approach with case study discussion, which re-synthesises the whole. A workbook is provided for attendants to complete during the day. Small groups are formed to allow 'time out' discussion in workshops, which are then fed back to the group for discussion and consensus. 'E' identifies barriers to epithelialisation and the action taken to prevent this. A session on exploring the benefits and limitations of different methods of wound measurement is included in 'E'. WBP and TIME study days can accommodate between 30 and 40 nurses or podiatrists per session to allow for optimal interaction and small workgroups. Previously, around 15% of participants have gone on to complete the wound management module at Caledonian University. Since introducing the workshop approach with the introduction of TIME, the numbers of people interested in carrying out the accredited work have changed very little. Collaboration with TVNs involved in paediatric wound care is currently taking place to extend the opportunities to all nurses and podiatrists across the city within the next year. This will ensure that everyone attending the study days will receive the same standard of education in complex wound management, regardless of the care setting in which they work. Follow-up evaluation of those involved in accreditation is still to take place, although positive feedback has been received verbally and from study day evaluation forms. Formal evaluation with secondary care colleagues is planned over the coming year. WBP and TIME provide a creative and structured approach to the management of compromised healing wounds, which is directly applicable to everyday practice. Access to clinicians at all levels is required to educate those carrying out wound care to adopt a consensus approach to wound assessment. Educational partnerships between health care authorities, commercial companies and HEIs can provide a creative way to deliver education and bridge the theory-practice gap. The success, in educational terms, of study days now requires proper evaluation. This article is supported by an educational grant from Smith & Nephew. The views expressed in this article are those of the authors and do not necessarily reflect those of Smith & Nephew. 1. Dowsett C. Developing wound management guidelines for community nurses. Br J Community Nurs 2002; 7(2): 62-8. 2. Schultz GS, Sibbald RG, Falanga V, Ayello EA, Dowsett C, Harding K, et al. Wound bed preparation: a systematic approach to wound management. Wound Repair Regen 2003; 11 Suppl 1: S1-S28. 3. European Wound Management Association (EWMA). Position Document:Wound Bed Preparation in Practice. London: MEP Ltd, 2004. Available from URL: http://www.ewma.org. 4. Sibbald RG, Williamson D, Orsted HL, Campbell K, Keast D, Krasner D, et al. Preparing the wound bed - debridement, bacterial balance, and moisture balance. Ostomy Wound Manage 2000; 46(11): 14-35. 5. Schultz G, Mozingo D, Romanelli M, Claxton K. Wound healing and TIME; new concepts and scientific applications. Wound Repair Regen 2005; 13(4 Suppl): S1-11. 6. Sorrells-Jones J, Weaver D. Knowledge workers and knowledge-intense organization, Part 1. A promising framework for nursing and healthcare. J Nurs Adm 1999; 29(7/8): 14-21. 7. Barnum BS. Nursing Theory. Analysis, Application, and Evaluation. New York: Lippincott, 1998. 8. Romanelli R, Flanagan M. After TIME: wound bed preparation for pressure ulcers. EWMA Journal 2005; 5(1): 22-30. 9. Lamond D, Thompson C. Intuition and analysis in decision making and choice. J Nurs Scholarsh 2000; 32(4): 411-4. 10. Starey N. What is Clinical Governance?. London: Hayward Medical Communications, 2003. 11. Stoedinova S. Developing a practical policy on working with company representatives. Prof Nurse 2004; 20(1): 47-8. 12. Scottish Executive. A Common Understanding Guidance on Joint Working between NHS Scotland and pharmaceutical industry. Edinburgh: Scottish Executive, 2003. Available from URL: http://www.scotland.gov.uk. 13. Flanagan M. Education and the development of specialist practice. J Wound Care 1998; 7(6): 304-5. 14. Jarvis P, Gibson S. The Teacher Practitioner and Mentor In Nursing, Midwifery and the Social Services. Second edition. Cheltenham: Stanley Thornes Ltd, 1997. 15. Furze G, Pearcey P. Continuing education in nursing: a review of the literature. J Adv Nurs 1999; 29(2): 355-63. 16. Fitgerald K. Instructional methods. In: Bastale SB, editor. Nurse as Educator: Principles of Teaching and Learning for Nursing Practice. Second edition. London: Jones and Bartlett Publishers, 2004. 17. Freeman AC, Sweeney K. Why general practitioners do not implement evidence: qualitative study. BMJ 2001; 323(7321): 1100-2. 18. Simpson EJ. The Classification of Educational Objectives. Psychomotor Domain. Urbana: University of Illinois, 1996. 19. Ousey K. The theory-practice gap - can it be bridged? Wound Management 2002; available from URL: http://www.woundmanagement.co.uk.